Whether it’s a helmet system for a soldier, pilot or emergency responder; a respiratory protection system for a welder; fabric for a firefighter’s suit; or a communication headset for an aircraft maintainer, Gentex Corporation takes the same approach to product design and engineering to achieve the maximum protection, performance, and user comfort possible. Gentex Corporation’s design and engineering teams transform customer challenges into solutions that work. 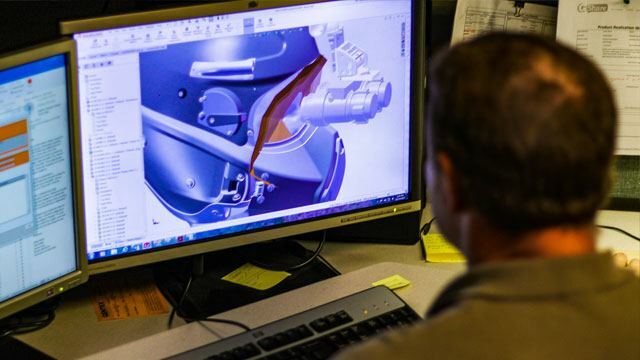 Each expert in their specific field—helmets, respiratory, optics, textiles, communications, noise suppression, and more—Gentex design and engineering specialists work to continually deliver best-in-class product solutions. Gentex collaborates internally and externally in the development of its solutions—input from customers, industry partners, academia, and internal resources (manufacturing, testing, R&D and other key functions) is all factored into product design. Considering all factors in the first stage of product development ensures the best solution to meet customer needs is produced efficiently. Gentex follows the principals of fit, form, and function when designing and engineering products. Further supporting this practice, our design and engineering teams specialize in the use of anthropometrics (body measurements) when creating our “body worn” solutions. Design and engineering of body worn products also requires factoring in the human-performance element, which is essential to the success of the person using the product. Whether it’s a soldier, a pilot, fire fighter, or welder, Gentex designers and engineers ensure the equipment we provide them compliments their activities while protecting them from harm. In order for different combinations of components to work together and achieve a desired capability, each use case scenario is carefully considered during the development of our system products. Only after the optimal performance of the system has been demonstrated can it then be broken down into a set of modular components. This approach to product integration results in systems with components that work together seamlessly and allow the end user to focus on their mission or job at hand, instead of their equipment setup. To provide maximum flexibility and forward compatibility, our system products are designed and engineered to easily integrate and work with Gentex Corporation and other third party components. This open architecture approach allows end users to choose from a variety of manufacturers and options, providing even greater opportunity for customization of their Gentex Corporation system solutions. Gentex designs and manufactures purpose-built solutions. Our unified, end-to-end processes ensure that customer requirements are translated into innovative, high-quality solutions that are optimized to meet specific requirements and that often surpass specifications. Additionally, using their own R&D, Gentex develops advanced solutions to address future and current customer needs. Information about the design and engineering of our individual solutions can be found on each product page.